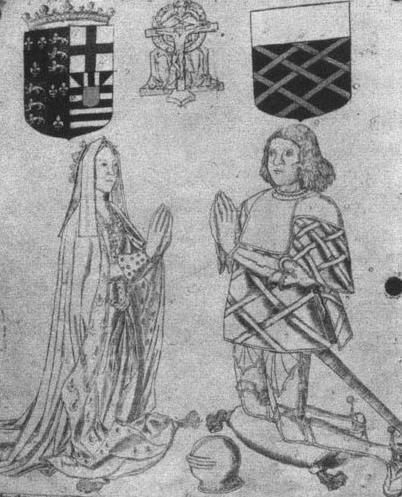 The St Leger family appears here on the ‘Man & Other Families’ website as the result of a series of marriages as follows: Anne St Leger married George Manners 11th Baron de Ros; their daughter Frances Manners married Sir Henry Nevill(e), 6th Lord Abergavenny; their daughter Mary Neville married Thomas Fane; their son Francis Fane married Mary Mildmay; their son Robert Fane married Elizabeth Cartwright; their daughter Elizabeth Fane married Lewis Incledon; their son Henry married Mary Davie; their daughterMary Incledon married Philip Rogers Webber; their daughter Mary Webber married John Harris; their son John Webber Harris married Louisa Ayton Desborough; their daughter Louisa Mary Harris married Edward Desborough Man. Thus Mary Neville was the ancestress of all those ‘Mans’ who are descended from Edward Desborough. Anne St Leger was born on 14 January 1476, Her father was Sir Thomas St Leger and her mother was Anne of York, Duchess of Exeter who died the same day of complications surrounding the birth of her daughter. Anne of York was the daughter of Richard Plantagenet and Cecily Neville.